How do you tackle the problem of convincing farmers to stop burning their crop fields after harvest? There is no simple solution to the problem. For the past several years, Warm Heart Environmental Program has been developing a biochar system that farmers can use to convert their crop waste into something valuable instead of burning it. Addressing the needs of the world’s poorest 2.54 billion people – all very small farmers – Warm Heart has taken on the two challenges that have led big development and environment agencies to dismiss biochar infeasible. First, Warm Heart has worked with poor farming villages to develop distributed production systems to demonstrate that they can produce huge quantities of biochar. Second, Warm Heart has worked with farmers to field-test biochar to demonstrate that they will switch to biochar when its economic superiority to alternatives is proven. Program engineers have designed biochar ovens that are efficient, easy and cheap to build and that individual farm families can use in their own fields to produce biochar for their own use or sale. The widespread distribution of this very low-cost technology could have far-reaching benefits for both the farmers and the environment. Through a grant from the US Consulate, Warm Heart has trained farmers how to convert from open field burning to making biochar. Warm Heart has also tested biochar-based fertilizers in farmers’ fields to prove to them that it is superior to the synthetic fertilizers they currently buy. Warm Heart now has the hard data and the farmer testimonials to show the world that converting to biochar makes real world economic sense. But to have a true impact, the Biochar Method needs to go viral. Field burning is a global problem that has global consequences; its solution lies at the local level where Warm Heart is working. Farmers across the world burn more than 330,000 gigatons of field wastes every year. The smoke they create makes up 25 percent of the world’s total of “black carbon”, the second-largest global warming source after CO2. Making biochar from just 25 percent of developing world field waste will annually eliminate 82,500 metric tons of black carbon and its warming effects. These numbers are daunting, but they are simply the sum of the actions of billions of very poor, very small farmers. The first challenge, therefore, is how to make it more profitable for them to make biochar than to burn. Warm Heart has proved that this is possible. Billions of very small farmers in the developing world have real incentives to make biochar – but they do not know it. It rests with the big international organizations, development NGOs and official aid agencies to spread the word. Widespread adoption of the Biochar Method will dramatically improve the lives of the rural poor and actually slow climate change. The possibility that farmers might embrace biochar leads to the second big problem. What do we do with all of the biochar they do not use in their fields? Currently there is no bulk biochar market. This needs to change. Biochar is great stuff, but so far little energy and less money has been invested in research outside of the narrow applications of biochar in developed world agriculture (where it seems not to be economically viable). No serious money has been invested in developing world or non-agricultural market research. Unlike the developed world, the developing world offers a huge potential agricultural market for biochar. Raw biochar can be converted into a natural super fertilizer that reduces the need for chemical fertilizers and pesticides (which leach into water supplies and contaminate the food chain), biochar brings life back to dead soils, which in turn improves crop quality and increases production. Biochar also retains huge amounts of water, making it a great, low-cost climate risk mitigation tool for the poor. And biochar is an excellent animal feed additive that improves animal health and weight gain. In the developed world, biochar has a wide variety of potential, profitable, applications. It can be used as a decontaminant and filtration media, concrete additive, desiccant, and replacement for such industrial materials as carbon black. Experimentation shows that it can be used in grid-sized super-capacitors, to improve food storage and to replace microbeads in many applications. The bottom line is clear: it is not only possible to make biochar cost-effectively; there is also ample potential demand for biochar pending only imagination and market research. Located in Chiang Mai Province, Mae Chaem is a small farming community that grows tens of thousands of tons of corn. A large portion of the smoke pollution that hits Chiang Mai every year comes from the burning of Mae Chaem’s corn waste. In conjunction with a grant from the Canadian Embassy, Warm Heart is managing a program in Mae Chaem working with a group of farmers to test the feasibility of switching from open field burning to a biochar system. When first approached with the project, the farmers objected that field burning was too difficult to address because the fields are so large. They argued that the project should start with the massive piles of corn cob waste that accumulates where corn from the fields is de-kernelled. In Mae Na Chon, the sub-district where the Warm Heart team started, de-kernelling produces almost 10,000 tons of cob and husk waste annually. The farmers felt that this would be sufficiently challenging. Warm Heart provided the materials and the farmers made 250 barrel biochar ovens. Few people were available to make biochar until the end of December because every extended family group was out picking. As the picking season peaked, farmers flocked to the barrels. By the end of January, farmers at a single site were making as much as 15 tons of biochar (750 barrels of biochar) per day. The sight was amazing to behold – but the pile of cob never diminished. While the training and processing has been successful, it is such a small fraction of the open field burning of crop waste that fills our skies with the dreaded smoke and haze every year. One thing has become clear – to clear as much air as we aspire to, we need an industrial size solution. But, boy, have we proved that the promise is there! Change is always difficult. 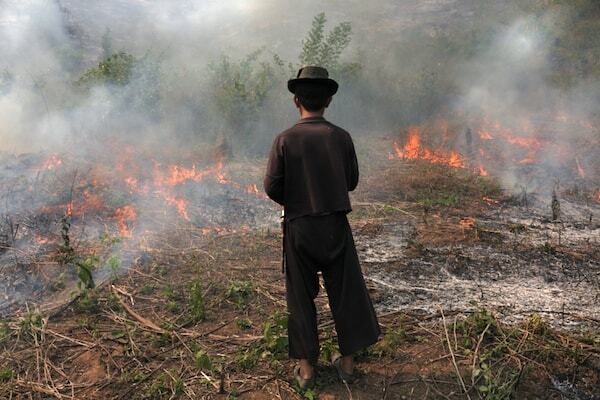 As an incentive to participate in our program, we are “buying the smoke” from the farmers. Mae Chaem taught Warm Heart three things.. First, it proved beyond a doubt that small farmers are very aware of the health consequences of smoke and are ready to try new methods to reduce smoke if they make financial sense. Second, it proved that even the use of very small-scale technology can quickly produce far more biochar than farmers can use, and that it is therefore essential to have an easily accessed external market for surplus. Third, it proved that while the family-sized machine approach will be accepted and is appropriate in a countryside of dispersed, small farms, even a very large number together cannot cope with industrial-scale waste production of the sort found in Mae Chaem, which produces 95,000 tons of corn waste annually. The Mae Chaem pilot project has taught the Warm Heart Biochar Team how to differentiate among locations and to select the correct technical solution for each. Where the bulk of the developing world crop waste smoke problem originates from the fields of billions of widely dispersed small farmers, very low-cost, low-tech machines distributed to individual families makes financial and organizational sense. Where the characteristics of the crop result in concentrations of large amounts of waste in central locations, larger equipment is necessary. Where the amounts of waste are truly immense (as in Mae Chaem or the Punjab), a switch to an entirely different technology, biomass gasifier power plants, is required. In March 2017, Warm Heart hopes to begin a collaboration with Chiang Mai University to test a truck mounted biochar system capable of producing 1 ton of char an hour. Warm Heart is already working with local officials to form a sub-district cooperative to build a 1 MW biomass gasifier power plant that will convert 17,000 tons of corn waste to biochar annually.